Product information "Rhodium plating solution"
Tifoo Rhodium electrolyte - rhodium-plated jewellery - done by yourself. 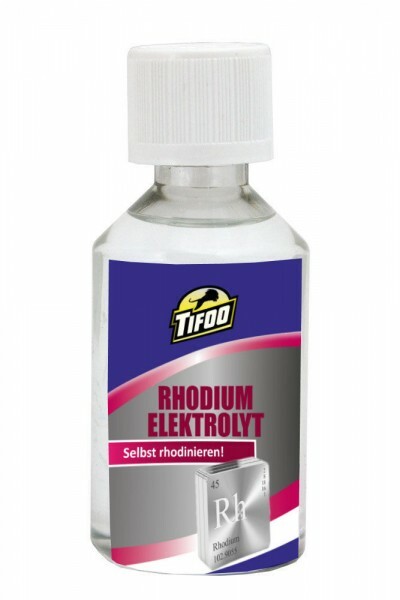 The Tifoo Rhodium electrolyte allows you easy rhodium-plating of jewellery, silverware and also various non-ferrous heavy metals like copper, brass or bronze. Rhodium-plating with the Tifoo Rhodium electrolyte can also be used for nickel. For example, rhodium gives your rhodium-plated jewellery a permanent protection from the typical blackening or tarnishing. As rhodium is a chemically very resistant precious metal, it itself doesn't tarnish and the gleam will stay for a long time. If you're new to electroplating, we will be gladly at your disposal with our detailled instruction manuals as well as our competent customer-support. That's why refining of all kinds of objects can also be realized by laymen. Don't hesitate in contacting us. Before realizing the rhodium-plating with the Tifoo Rhodium plating solution, please always follow the indications on the label and the corresponding instruction manual. Keep the rhodium plating solution out of the reach of children and wear suitable protective equipment. Related links to "Rhodium plating solution"
Instruction manual for Tifoo Rhodium plating solution as PDF file. Customer evaluation for "Rhodium plating solution"